Moving on... if you are looking for a cute and easy "just because" project, I've got one for you. Not really a new concepts but they are fun to make, look super cute on a shelf and are easy to whip up. Gather your supplies. You'll need: A piece of wood, mine was 1x4inches. Paint, Paint brush, Mod Podge, and a cute photo. You might want sand paper, distressing ink and some rub-ons, too. 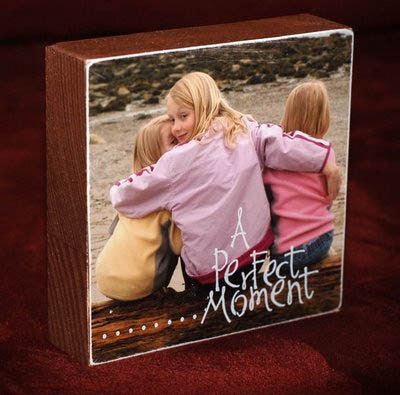 Step 2: Trim photo to correct size so that it is the same size as one face of your block. 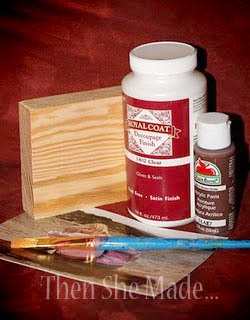 Step 3: Add Mod Podge to the flat surface of your wood block and before it dries, adhere photo in place. Let dry. Step 5: Add a rub-on message and display on shelf. See! Told you it was easy. Wow! What a neat idea! Thanks for sharing!!! That came out really cute. I need to get some mod podge someday. Really cute! Looks pretty easy as well, which is always great! I love the picture you chose too, it's darling! I'm hosting a craft night project link party - I would love it if you would link up this project!